Nearly 100 years later, people’s fascination with the Titanic is still going strong. Just take a look at the Titanic 100th Anniversary Coin to see what I mean. To commemorate the triumph and tragedy that was the RMS Titanic, the cruise ship Balmoral, will set sail in early April of 2010 and sail the exact same route as the Titanic. The ship will be operated by Fred Olsen Cruise Lines, whose parent company Harland Wollf is responsible for building the Titanic. Sticking to the facts, the Titanic 100 anniversary cruise will carry 1,309 passengers, sail the same route as the Titanic, make all of the same stops, and even sail to the place where she met her watery grave. After leaving from Southampton, the Balmoral will sail to the Irish port of Cobh (formerly known as Queenstown). The ship will then sail through the north Atlantic and reach the final resting place of the Titanic. A memorial ceremony remembering the Titanic sinking will be held between 11:40 pm and 2:20 am. Truly a modern marvel of her time, the Titanic is still able to travel at faster speeds than the Balmoral despite being built nearly 80 years earlier. After traveling to the spot of the Titanic disaster, the cruise will continue to sail and take passengers to the Fairview Lawn Cemetery where 121 passengers of the original Titanic hare laid to rest. Everything on the Titanic 100 year anniversary cruise will be tailored to fit the feel of the original vessel. From the food, all the way down to the entertainment will reflect the parlance of the era in which the Titanic was present. Passengers will also be able to hear from Titanic historians and scholars in order to gain a better understandi9ng of what was a true masterpiece of her time. Reservations began earlier this month and tickets are going fast. Prices for an inside cabin on the MS Balmoral begin at $3,900. The Titanic 100 year anniversary cruise is the perfect way to commemorate the marvel that was the Titanic and a great place to learn more about the historic vessel. 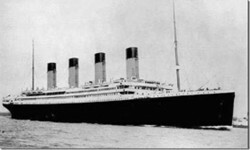 Interest in the Titanic is as strong as ever, and the Titanic anniversary cruise is proof of the ship’s legendary saga.